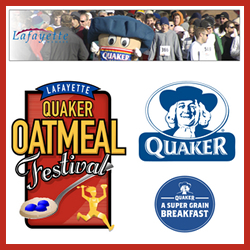 Take part in the annual Lafayette Quaker Oatmeal Festival in January in Lafayette Colorado. Festivities include: the Hot Oatmeal Breakfast, Health Fair and screenings, the Quaker 5K Walk/Run, the Oatmeal Baking Contest, and much more! Free shuttles are available, and a special “Thank You” to the Oatmeal Festival sponsors.